Latin is an ancient Indo-European language originally spoken in Latium, the region immediately surrounding Rome. Latin gained wide currency as the formal language of the Roman Republic and Roman Empire, and was also later adopted by medieval scholars, as well as the Catholic Church. An inflectional and synthetic language, Latin relies little on word order, conveying meaning through a system of affixes attached to word stems. 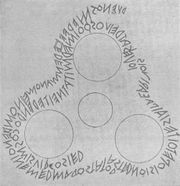 The Latin alphabet, derived from that of the Etruscans and Greeks, remains the most widely used alphabet in the world. Although Latin is now widely considered to be an extinct language, with very few fluent speakers and no native ones, it has exerted a major influence on many other languages that are still thriving and continues to see significant use in science, academia, and law. Romance languages are descended from Vulgar Latin, and many words adapted from Latin are found in other modern languages—including English, where roughly six out of every ten commonly-used words are derived, directly or indirectly, from Latin. This is part of its legacy as the lingua franca of the Western world for over a thousand years. 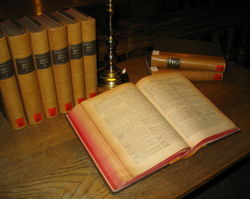 Latin was only replaced in this capacity by French in the 18th century, though Latin continued to be used in some intellectual and political circles. The Roman Catholic Church used Latin as its primary liturgical language until the advent of the Second Vatican Council in the 1960s, after which the various vernacular languages of its members were allowed in the liturgy. However, Ecclesiastical Latin remains the official language of Vatican City. Until recently, it was common to find Classical Latin, the literary language of the late Republic and early Empire, taught in many primary, grammar, and secondary schools throughout the world, often combined with Greek as the study of Classics. Latin is a member of the family of Italic languages, and its alphabet, the Latin alphabet, is based on the Old Italic alphabet, which is in turn derived from the Greek alphabet. Latin was first brought to the Italian peninsula in the 9th or 8th century BC by migrants from the north, who settled in the Latium region, specifically around the River Tiber, where the Roman civilization first developed. Latin was influenced by the Celtic dialects and the non- Indo-European Etruscan language of northern Italy, as well as by the Greek of southern Italy. Although surviving Roman literature consists almost entirely of Classical Latin, an artificial and highly stylized literary language whose Golden Age stretched from the 1st century BC to the 1st century AD (encompassing the greatest Roman prose writers and poets like Cicero, Virgil, Ovid, Livy, and Caesar, among others), the actual spoken language of the Western Roman Empire was Vulgar Latin, which significantly differed from Classical Latin in grammar, vocabulary, and (eventually) pronunciation. Interestingly, while Latin long remained the legal and governmental language of the entire Roman Empire, Greek came to be the language most often used among the well-educated elite—as much of the literature and philosophy studied by upper-class Romans had been produced by Greek (usually Athenian) authors. In the eastern half of the Roman Empire, which became the Byzantine Empire after the final split of the Eastern and Western Roman Empires in 395 AD, Greek eventually supplanted Latin as the legal and governmental language, in keeping with the fact that it had long been the spoken language of most Eastern citizens (of all classes). The language of Rome has had a profound impact on later cultures, as demonstrated by this Latin Bible from 1407 AD. The expansion of the Roman Empire spread Latin throughout Europe, and, eventually, Vulgar Latin began to dialectize, based on the location of its various speakers. Vulgar Latin gradually evolved into a number of distinct Romance languages; a process well underway by the 9th century AD. These were for many centuries only oral languages, Latin still being used for writing. 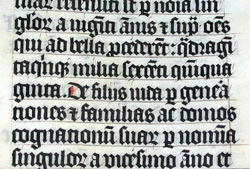 For example, Latin was still the official language of Portugal in 1296, after which time it was replaced by Portuguese. Many of these "daughter" languages, including Portuguese, Spanish, French, Italian, and Romanian, flourished, the differences between them growing greater and more formal over time. Out of the Romance languages, Italian is generally considered the purest descendant of Latin in terms of vocabulary, though Romanian more closely preserves the Classical declension system, and Sardinian is the most conservative in terms of phonology. Classical Latin and the Romance languages differ in a number of ways, and some of these differences have been used in attempts to reconstruct Vulgar Latin. For example, the Romance languages have distinctive stress on certain syllables, whereas Latin had distinctive length of vowels. In Italian and Sardo logudorese, there is distinctive length of consonants and stress, in Spanish only distinctive stress, and in French length and stress are no longer distinctive. Another major distinction between Romance and Latin is that all Romance languages, excluding Romanian, have lost their case endings in most words, except for some pronouns. Romanian exhibits a direct case (nominative/accusative), an indirect case (dative/genitive), and a vocative, but linguists have said that the case endings are a Balkan innovation. There has also been a major Latin influence in English. Although English is not descended from Latin, being Germanic, rather than Romance, in origin— Britannia was a Roman province, but the Roman presence in Britain had effectively disappeared by the time of the Anglo-Saxon invasions—English borrows heavily from Latin and Latin-derived words: 60 per cent of the English vocabulary finds its roots in Latin. In the medieval period, much of this borrowing occurred indirectly after the Norman Conquest or through ecclesiastical usage. After the Conquest, the new King of England, William the Conqueror, spoke Norman, and Anglo-Norman became the accepted language of the court and nobility. The Anglo-Saxon language remained the speech of the vast bulk of the population however, and it was eventually and gradually readopted by the ruling classes. English grammar remains independent of Latin grammar, even though prescriptive grammarians in English have been heavily influenced by Latin. Attempts to make English grammar follow some Latin rules, such as the "prohibition" on split infinitives, have been met with some resistance from those who believe splitting infinitives occasionally improves the clarity of English. From the 16th to the 18th centuries, English writers cobbled together huge numbers of new words from Latin and Greek roots. These words were dubbed " inkhorn" or " inkpot" words, as if they had spilled from a pot of ink. Many of these words were used once by the author and then forgotten, but some were so useful that they survived. Imbibe, extrapolate, dormant and employer are all inkhorn terms carved from Latin words. Thus, many of the most common polysyllabic "English" words are simply adapted Latin forms, in a large number of cases adapted by way of Old French. Latin is a synthetic inflectional language: affixes (often suffixes, which usually encode more than one grammatical category) are attached to fixed stems to express gender, number, and case in adjectives, nouns, and pronouns—a process called " declension". Affixes are attached to fixed stems of verbs, as well, to denote person, number, tense, voice, mood, and aspect—a process called " conjugation". There are five Latin noun declensions. Every Latin noun belongs to one of these, each of which has a specific set of endings that are added to denote number and case (or grammatical "role") within any given sentence. Each declension and case has unique characteristics, "rules" (such as a more common gender or a vowel placed between many of the endings), and exceptions. Nominative: used when the noun is the subject of the verb or the predicate nominative. Genitive: used to indicate possession or origin. Dative: used when the noun is the indirect object of the verb, usually with verbs of giving, showing, helping, trusting, or telling. Accusative: used when the noun is the direct object of the verb or object of certain prepositions, or to denote movement towards. Vocative: used when the noun is used in a direct address (usually of a person, but not always, as in O Tempora! O Mores! ; the only time there is a difference between the vocative and nominative cases is in a masculine, singular, second declension noun. Ablative: used when the noun shows separation or movement from, source, cause, agent, or instrument, or when the noun is used as the object of certain prepositions. Locative: used only with certain nouns (including names of cities, towns, small islands among others) to denote location (for instance Rōmae "in Rome", domī "at home"). Note: The lexical entry for a noun lists the nominative followed by the genitive. An example of this would be mundus, -ī. The "ī" represents the genitive construction of the word, mundī. Some nouns, most commonly in the third declension, undergo a stem change after the nominative, thus: pax, pacis. The fourth principal part is the supine form, or equivalently, thenominative case, singular, perfect tense, passive voice participle form of the verb. The fourth principal part can show either one gender of the participle, or all three genders (-us for masculine, -a for feminine, and -um for neuter). Although Latin was once the universal academic language in Europe, in the latter part of the 20th century it has been supplanted by the study of many other languages; it is a requirement in relatively few places, and in some universities is not even offered. However, in Italy, Latin is still compulsory in secondary schools such as the Liceo Classico and Liceo Scientifico, which are usually attended by people who aim to the highest level of education. In Liceo Classico, ancient Greek is also a compulsory subject. In Spain, Latin is a compulsory subject for all those who study humanities (students can select three sort of studies: sciences, humanities or a mixture) in grades 11th and 12th. In France and Canada, Latin is optionally studied in secondary school. In Greece, Latin is compulsory for students who wish to study humanities, and is one of the six subjects tested in Greek examinations for entry into humanitarian University courses. In Germany, Belgium, Austria and the Netherlands, Latin is studied at the highest level of high schools called Gymnasium. Latin was once taught in many of the schools in Britain with academic leanings—perhaps 25% of the total. However, the requirement to learn Latin for admission to university for professions in law and medicine was gradually abandoned, beginning in the 1960s. After the introduction of the Modern Language General Certificate of Secondary Education in the 1980s, Latin was gradually replaced by other languages in many schools, but remains taught in others, particularly in the private sector. However only one British exam board now offers Latin ( OCR), since the exam board AQA recently stopped offering it. In the United States Latin is still taught in some high schools. It remains a required class (minimum 3 years) at the oldest public school in the new world, Boston Latin School. The linguistic element of Latin courses offered in secondary schools and in universities is primarily geared toward an ability to translate Latin texts into modern languages, rather than using it for the purpose of oral communication. As such, the skill of reading is heavily emphasized, whereas speaking and listening skills are barely practiced. However, there is a growing movement, sometimes known as the Living Latin movement, whose supporters believe that Latin can be taught in the same way that modern "living" languages are taught, i.e. as a means of both spoken and written communication. This approach to learning the language assists speculative insight into how ancient authors spoke and incorporated sounds of the language stylistically; patterns in Latin poetry and literature can be difficult to identify without an understanding of the sounds of words. Institutions offering Living Latin instruction include the Vatican and the University of Kentucky. In Great Britain, the Classical Association encourages this approach, and Latin language books describing the adventures of a mouse called Minimus have been published. In the United States, the National Junior Classical League (with more than 50,000 members) encourages high school students to pursue the study of Latin, and the National Senior Classical League encourages college students to continue their studies of the language. Many international auxiliary languages have been heavily influenced by Latin, and the moderately successful Interlingua is a modernized and simplified version of the language.